COLUMBUS, Indiana. To no surprise, Tim Denoyer, vice president & senior analyst, ACT Research, told attendees at the ACT Research Seminar 60 conference that freight slowed sharply in the second half of 2018. Most freight metrics are starting 2019 on a downward trend, and that has ACT forecasting slower freight growth and lower, maybe even negative, rate changes in 2019. Denoyer said the firm is now predicting just 1 percent growth in truckload (TL) loads and 2 percent in intermodal while less-than-truckload (LTL) will see a slight decline this year. Within intermodal, secular growth is slowing as costs have risen closer to those of truckload, and while last mile freight is growing quickly, it remains less than 1 percent of the total freight market, Denoyer said. The slowdown will hold down rate growth, with Denoyer suggesting truckload contract rates (net fuel) will rise 1 percent this year to $2.52 per mile, holding mostly steady throughout the year. LTL rate per CWT (net fuel) year-over-year will rise 4 percent to $18.64 while intermodal rate per load year-over-year is pegged for a 1 percent increase to $2,071. In 2020, the numbers are forecast for $2.47, $18.97, and $2,112. Denoyer said the total freight market was $803 billion in 2018, with for-hire truckload and private fleet truckload making up 60.2 percent of the market combined. Less-than-truckload was just 4.5 percent and couriers 11.7 percent. Pipeline (6.3 percent), Rail car (6.4 percent), Water (6 percent) and intermodal (2.7 percent) make up the majority of the rest of the market. The analyst noted that the Cass Shipment Index was down 2.1 percent year-over-year in February in its third straight month of decline. LTL tonnage fell 2.5 percent year-over-year in February for public carriers, but Denoyer noted that LTL carrier New England Motor Freight went bankrupt in mid-February. One of the metrics Denoyer follows is LTL weight per shipment, which he said leads the ISM Manufacturing Composite Index by about two to three months with a 75 percent correlation. LTL weight per shipment has fallen about 2 percent year-to-date. Rail volumes are also down so far, with carloads excluding intermodal dropping 0.7 percent year-to-date. 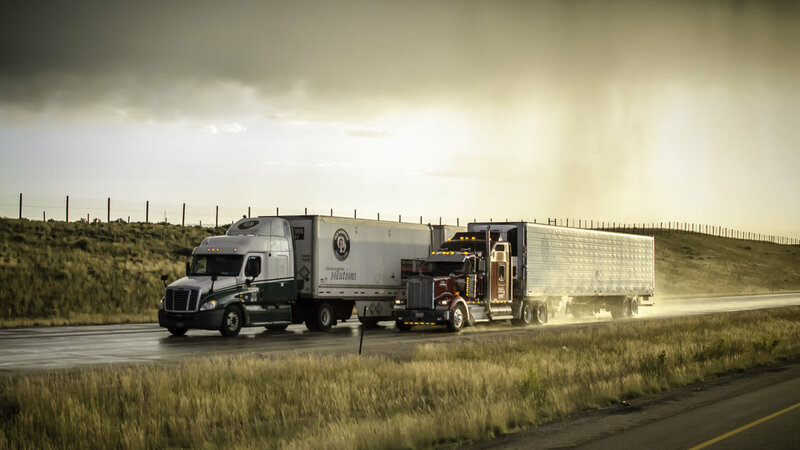 Looking historically, Denoyer said freight growth cycles tend to last about two years, and early 2019 returns seem to be following that same pattern with both the ACT For-Hire Trucking volumes and freight rates indexes falling. Both seasonally adjusted indexes have fallen below readings of 50, indicating contraction. Among the economic drivers suggesting a slowdown are increased inventories and weather and concerns over tariffs, industrial production, financial conditions and private fleet growth. After building late last year and early this year, inventories may be more settled by the second half of the year, Denoyer said, which would be a positive. Spot rates are forecast to fall 20 percent year-over-year over the next three months (they are down about 13 percent already), according to ACT’s Spot Leading Indicator (SLI), which Denoyer said leads dry van spot rates by 2-3 months with an 88 percent correlation. Contract rates will also see a drop happening in the second quarter of 2019 due to supply and demand loosening with a recovery forecast in 2020 based on a 32 percent drop in tractor sales that holds capacity down. “I think rates will continue to be positive through the first half of 2019, mainly due to the contracts that were signed last year, but then I think it will turn negative,” Denoyer said, pointing out that contract rates could fall 4 percent in each of the third and fourth quarter after posting gains close to 8 percent in the first quarter. If freight is impacted by a trade war, it could drive rates negative earlier this year, Denoyer said, conversely, any trade deal with China could be a boon. Part of the impact of tariffs is how they change freight flows as businesses try to get ahead of potential tariffs and move goods. “It interrupts the organic flow of supplies and then you have the payback period, so it’s distorted and it makes the impact that much harder to read,” Jim Meil, principal, industry anaylsis, ACT Research, said. For carriers’ profitability, Denoyer said to expect margins to fall in the second half of 2019 yet remain near historic highs. He said that truckload revenue per mile is up about 13% and is correlated to a 300 basis points increase in trucking margins.